With gifts to buy, baking to do, office parties to attend, and family coming to visit, it's easy to feel overwhelmed during this time of year. The Bible refers to Jesus in the book of Isaiah 9:6 as the Prince of Peace. So whether it's peace in our hearts or homes, peace at our jobs, or in our relationships, if we need peace we only need visit the source - Jesus, the Prince of Peace. Sip a steamy mug of tea, listen to inspiring music, and relax while you piece together a puzzle that captures the beauty of the season. 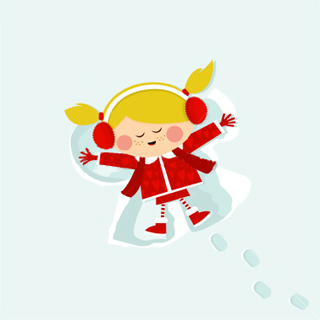 Tell what you do to chase away the winter blues or lift your spirits when you get discouraged. Send me an email on or before December 17th. I'll post some of the entries in a future update. 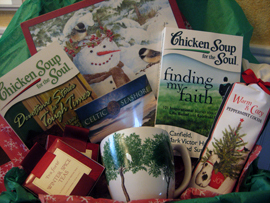 Box contains: Two Chicken Soup for the Soul books — Devotional Stories for Tough Times and Finding My Faith — Solitude's Celtic Seashore cd, Natural Beauty Mug from Molbak's, Tea Forté Winter Spice tea and Warm & Cozy Peppermint Cocoa, & Chickadee Snowman puzzle from Lang. It's the spirit of sweet friendship that brightens all year. For peace, for understanding, And for goodwill to men!" Thank you dear reader for taking time to stop by. May Jesus fill your heart and home with His peace this season and throughout the coming year! Grant that I may bring no tear to any eye. And made of it a happy year." "We can always find something to be thankful for, and there may be reasons why we ought to be thankful for even those dispensations, which appear dark and frowning." Two weeks ago a vehicle hit our eleven-year-old granddaughter in the crosswalk in front of her school. Loren and I huddled in the hospital emergency room with our daughter and her husband, and our former son-in-law (our granddaughter's dad) and his wife. Amidst hugs and tears, we waited hours for news of our granddaughter's condition. Nurses and doctors returned with results of tests; "The MRI shows her brain is okay." Then, "Her shoulder is not broken,"... "Her pelvis is okay," ... With each report, we gave thanks to the Lord. In the end it came down to a badly broken leg and broken toes. And while we don't know all the effects this will have on our granddaughter, we're thankful she's alive. We're also thankful we've maintained a good relationship with our former son-in-law, his parents, and his new family. We don't always understand the dark circumstances that color our lives, but even in their midst we can choose to give thanks. Cream together first three ingredients until fluffy. Add next 4 ingredients. Mix well. Then add nuts. Shape into 1" balls and put on lightly greased cookie sheets. Bake at 325º for about 15 minutes. Cool on racks. Roll in powdered sugar. Enjoy with a cup of hot coffee, tea, or cocoa. This recipe was a favorite at the annual neighborhood cookie exchange when I was growing up. Tanya - We have traditional social events that we go to each year. We pencil them in on the calendar, and if something new comes up we see if there is a time slot for it. Because social events can get out of control, planning to have one event each week or two has helped immensely, and being able to say no to others takes the pressure off. That way you enjoy the holidays and everyone has a good time. Pamela - I seize opportunities to spend time with my favorite people instead of using precious time to spend money on excesses. Denise - I try to not let the season get the better of me...smile at a stranger, put a dollar — not just change — into the Salvation Army Kettle, say Merry Christmas, spread the cheer and the stress relieves itself. Stefanie - To control my stress during the holidays, I try to plan everything. When having family and friends over I always let them help by bringing a dish or help me decorate beforehand. I keep food simple for parties, and try to prepare as much ahead of time as I can so I can spend parties with my guests and not in the kitchen. I also try out new recipes before the holidays so I can make sure they taste great for my holiday dinners. Nancy - My motto during the Christmas season is, "Be still and know that I am God." When I don't start my day being still with Him, the Christmas frenzy makes me feel crazy. When I do, I'm a different person. Pray for the Lord's presence and His peace over your gathering. Set the mood with soft instrumental music and lighted candles. Complete as much of your work ahead of time so you don't feel rushed when guests arrive. Invite each guest to share a funny or favorite holiday memory. This will help lighten the tone and direct conversation away from topics of politics, or family troubles & disagreements. Host separate dinners with family members. Loren and I did this one year, and for us it was one of our best Christmas celebrations because we were able to devote focused attention on each family rather than all twenty-three members at once. Use decorative name tags to assign seating. Don't seat guests involved in a dispute next to or across from each other, but separate them by other visitors.